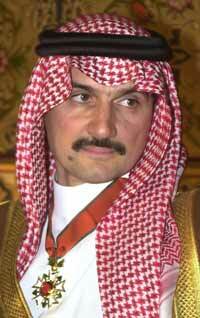 Prince Al-Waleed bin Talal bin Abdul Aziz Al-Saud (الوليد بن طلال بن عبد العزيز آل سعود) is a member of the Saudi Arabian royal family. He was ranked the 13th richest person in the world by Forbes magazine in 2007. His net-worth is estimated to be around $23.7 billion. Jerusalem Dev. & Investment Co. He also has 20% ownership of Planet Hollywood. The Center for Muslim-Christian Understanding at Washington, DC, was founded in 1993. The Center is aimed to advance education in the fields of Islamic civilization, and build an stronger bridge of understanding between the Muslim world and the West as well as between Islam and Christianity. The Center is part of the Edmund A. Walsh School of Foreign Service at Georgetown University. In 2005, The Center received a $20 million gift from HRH Prince Alwaleed Bin Talal. This gift increased the Center ability to advance in facilitating cross-cultural and inter-religious dialogue. John L. Esposito is its current director, and John O. Voll an associate director.